St. Joseph Catholic Church’s parish began in 1845. The first church building was erected in Danville at the corner of Pine and Center Streets. The current brick church located at 18 East Street in Danville was built in 1867. The church was originally part of the Philadelphia Diocese until the Harrisburg Diocese was formed in 1868. The sanctuary has undergone a number of renovations over the past 145 years. Historic photographs show major changes in wall and ceiling decorations, overpainting of flanking altar side murals, changes in sculptures, changes to the physical size and placement of the high altar and side altars and installation and alteration of the altar railing. 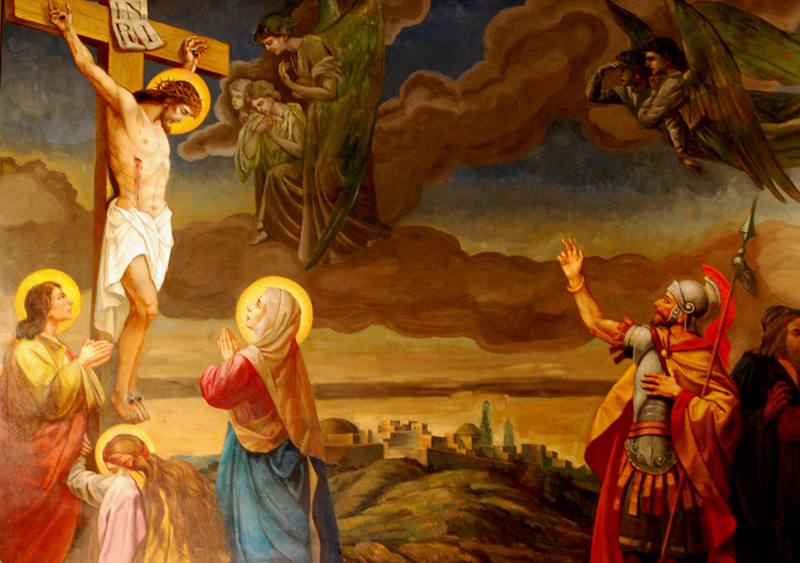 Despite all of the physical changes to the sanctuary the altar mural of Christ’s Crucifixion was not changed. 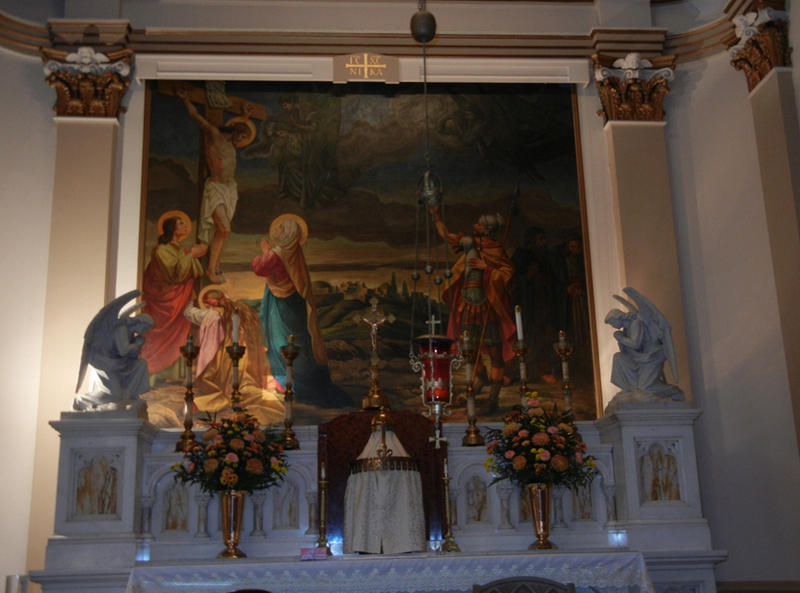 The altar mural appears to be older than St. Joseph’s Church. It was painted using oil paints on canvas and was potentially moved here from another church, quite possibly from the original St. Joseph’s church in town, although no one can confirm this. In 2011 Strosser Architecture and Conservation of Lewisburg, PA was retained to redesign the interior of the church bringing it back to an earlier appearance, but not the original 1867 decorative schemes because so much had been altered in the furnishings, railings and artwork. Zartman Construction of Northumberland, PA was selected to be the general contractor. 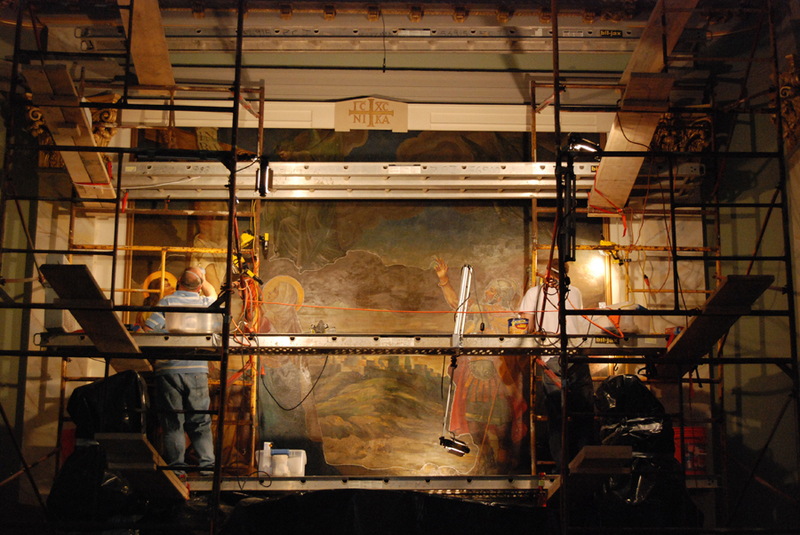 Hartmann Conservation worked along with Zartman, but was hired directly by the Diocese of Harrisburg to conserve the altar mural. Work on the mural took place during May and June of 2012. The canvas painting portion measures 11’h x 13’w and was attached to the plaster wall behind the high altar with animal skin glue. When it was installed it was severely altered. A lower extension to the painting was added (6’h and 13’w) directly onto the plaster wall using oil paints. During installation of the canvas in the 1860’s, twelve 1’- 4’ long cuts were made in the canvas along the edges of design elements to enable the canvas to sit flat on the new plaster wall. The canvas might have been stretched out of plane at the bottom from not being stretched properly on its original stretcher. When the canvas was attached to the new wall some of the cuts now overlap by as much as 2”, making the original artist’s design elements no longer match up. The installer then overpainted these areas to cover their cuts and sloppy installation. The cuts were not filled prior to retouching or overpainting with exception of where they overlapped. As a result of this installation, 60 to 70% of the original mural was overpainted (presumably by the decorative painting firm that created all of the artwork in the new 1867 church). The paint style of the overpaint was very different than that of the fluid application of the original. 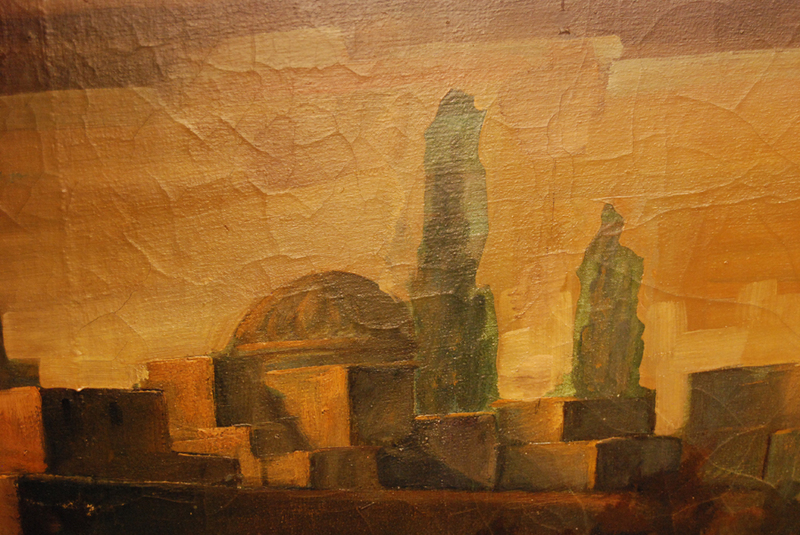 The colors were darker, muddier and applied using very wide block-like paint strokes. The main figures were not greatly overpainted, but some of the trains on the dresses were shortened, angels were added in the sky, rocks were added at the bottom where original artwork meets the plaster addition, and the Roman soldier’s plume on his helmet was painted out. It appears that the integrity of the original artist’s work was not as important as the intended so-called improvement of the entire piece. The hard part to understand is that the lower 5 foot of added mural is directly behind the high altar and would never have been able to be viewed by the parishioners except maybe during the first couple of years after the church was built before the high altar was installed. The original canvas painting had at least two heavily discolored natural resin varnish coatings, one under the overpaint and one on top. 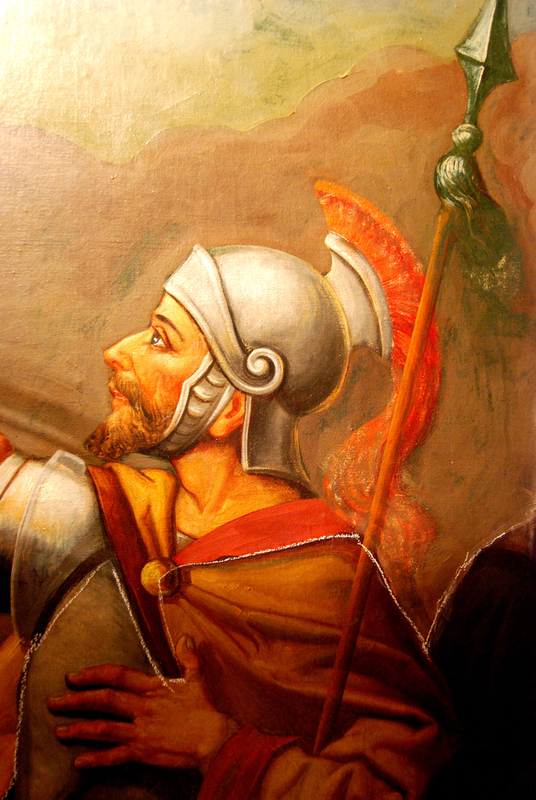 If cleaned, the lower portion of the painting on plaster would not match the colors of the original canvas particularly if the overpaint is removed. On top of the varnish coating was a heavy layer of dirt and oily soot from the churches original coal fired furnace and from candles used on the high altar. 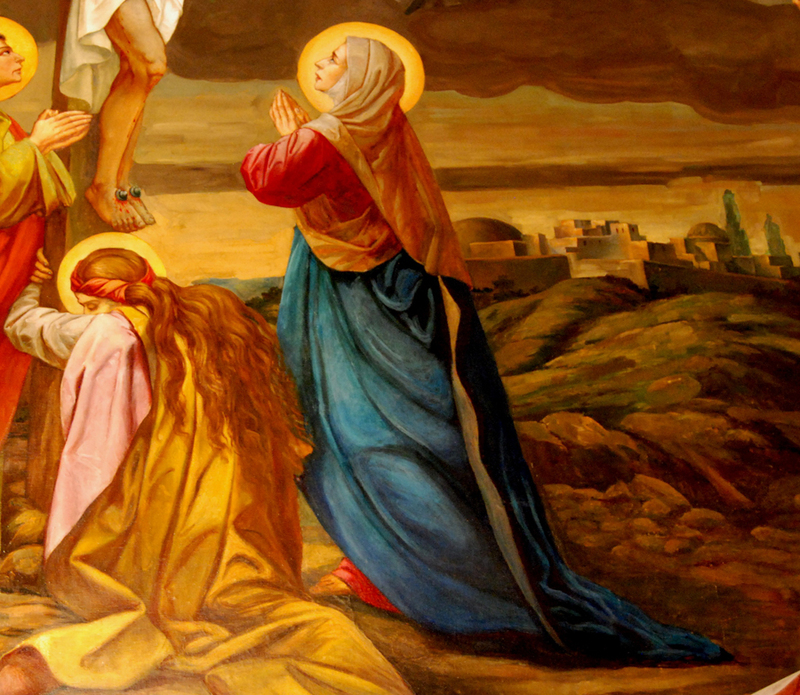 The original painting was initially stretched onto a wooden stretcher with a central vertical cross bar. Evidence of the shape of the cross bar and the inner edges of the stretcher could be seen in the painting as straight horizontal or vertical crack lines in the paint. There is an overall pronounced crack pattern in the surface of the painting that would have only have been present if the painting was stretched and not initially glued to a flat stable surface. Zartman Construction erected scaffolding over the high altar in the front of the church allowing full access to the painting on two levels. Overall photographic documentation was somewhat difficult because there was no way of getting an unobstructed view of the mural without scaffolding (except before & after treatment photography) and around sculptural forms on the altar. We began treatment by starting to remove the oily soot and discolored natural resin varnish coatings using organic solvents. 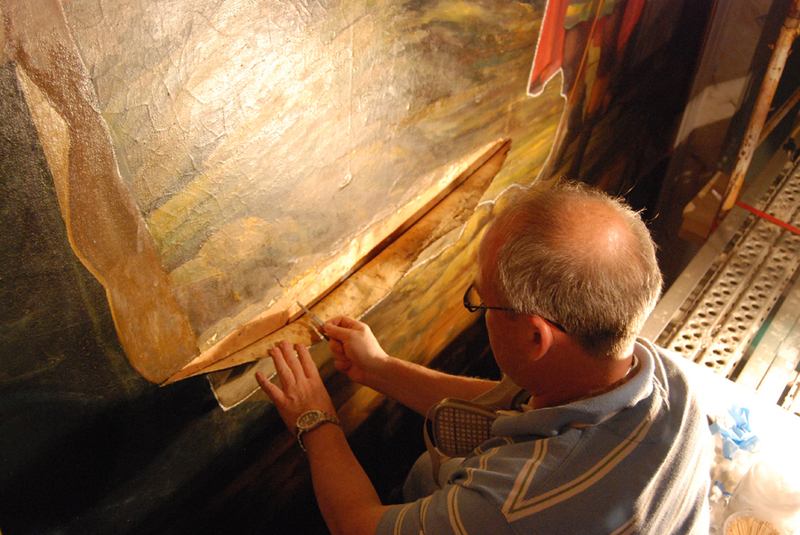 We soon discovered the extent of overpaint (60 – 70%), that the muddy overpaint more closely matched the original discolored varnish, and that the painting had not been cleaned prior to its installation in the 1860’s. When the painting was glued to the wall, it was cut along numerous design outlines to allow it to fit the contour of the wall. It was misaligned in some instances because canvas that had been stretched out of plane now overlapped when it was reinstalled. Where the canvas overlapped we found that these areas had been heavily troweled over with a dense Bondo-like filling material. We removed this filling with both organic chemicals and scalpels in preparation for realigning & reattaching the canvas edges to the wall. It was necessary to trim away the overlapping original canvas to accomplish this task (which normally would have been ethically questionable, but because we couldn’t take it off the wall it was deemed acceptable). This would allow it to now lay flat on the surface of the wall. Canvas was reattached to the wall using a conservation grade thermoplastic adhesive. With the original artist’s paint now exposed, the brilliance of color no longer matched the muddy overpaint around this area and the original art didn’t line up with itself even more. This was really unavoidable and meant that we would have to further correct colors and design elements when we finally inpainted losses and damages in the surface. 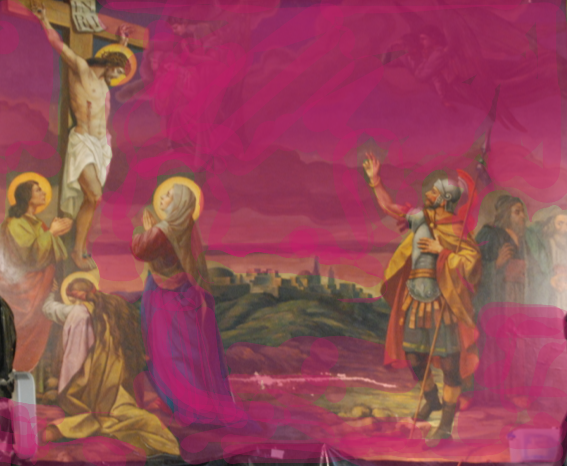 After cleaning the main figures surface’s that were original to the artist’s composition, we held several discussions with the Architect and the Church’s Project Manager to talk about what we should do with the overpaint on the rest of the painting. It was decided that the majority of the overpaint should remain, because we had a fixed budget for the project, there was a hard deadline for completion, the parishioners only new the painting as it currently existed with four angels in the sky. We also were somewhat suspicious about the condition of the original painting because we found that the 1860’s installers also sanded the surface of the painting to smooth out there cut joints and did not want to really open up a major can-of-worms. Overpaint was to be removed only where it was necessary to facilitate cut reallignments and where design elements had been obviously eliminated like the Roman soldier’s helmet plume, the fringe hanging from his spear, the trains of several dresses and Mary Magdalene’s proper left foot had been overpainted. After cleaning and dirt removal we applied an isolating brush coating of a matt varnish and then filled losses with gesso and inpainted with conservation grade acrylic paints. A final brush application of varnish was applied. Conservation took a little less than four weeks onsite with a crew of three people. We clean up and left the job site ahead of schedule and prior to completion of construction in the church. 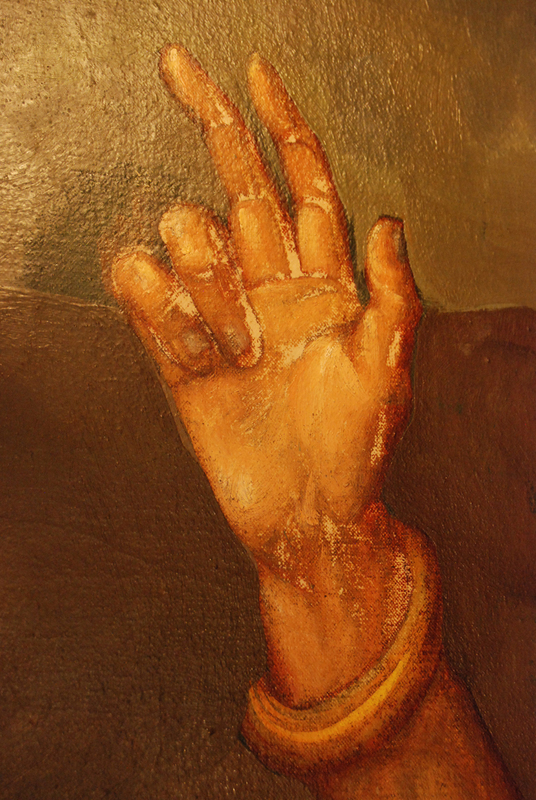 We understand that the Diocese of Harrisburg, the clergy and the parishioners were pleased with the changes in their painting following conservation.